Gobustan in Azerbaijan is a hill-mountain site in the southeast portion of the Big Caucasian Ridge, situated about 40 miles southwest of Baku, west of the Gobustan settlement. It was declared as one of the national historical landmarks of the country in 1996 for the preservation of the Gobustan rock drawings, mud volcanoes, gas stones and relics that are the main tourist attractions in the area. 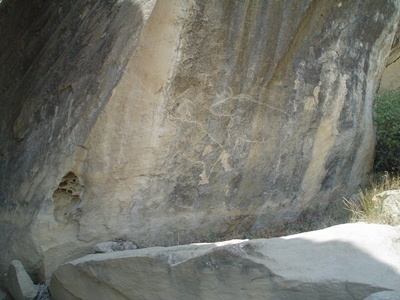 Also, in 2007 it was named by the United Nations Educational, Scientific, and Cultural Organization (UNESCO) as a World Heritage Site for the collection of rock engravings and art that convey the lifestyles during the prehistoric and medieval times in the country, plus the hunting, fauna, and flora which so abound in the region. Many centuries of exposure to the harsh elements—the sun, wind, seismic activity, atmospheric precipitation—had led to boulders and blocks being chipped away from the edges of a vast limestone layer up in the mountains, which then rolled down the slopes, pressed against one another and formed about twenty canopies and caves of varying sizes which has since served as natural shelter for the natives. Then, in 1930, a group of men went into the area to mine for gravel and discovered by accident the Gobustan rock drawings through one mining employee who had noticed them despite the abundance of boulders and other stone formations. Other man-made caverns were discovered after that, and within them, more Gobustan rock drawings were found, amounting to more than 6,000, dating as far back as 40,000 years. Remains of caves which were used as shelter and burial sites were also found, reflecting intensive human settlement and usage during the wet period which followed the last Ice Age. Most of the engravings depict men, animals, ritual dances, battle pieces, bullfights, warriors with lances in hand, boats with armed oarsmen, camel caravans, and pictures of the skies, the sun, and the stars. They are an exceptionally graphic testimony to the lifestyle of hunting and fishing during a period when the climate and vegetation of Gobustan were so much warmer and wetter than today’s.